The ceratopsid Einiosaurus. Reconstruction from here. Sometimes it's nice to write a post on something everyone's heard of, and I'm pretty sure almost everyone will have heard of this week's highlight taxon - the Ceratopsia. In one of my earliest posts on the Catalogue of Organisms, I nominated Triceratops horridus as one of the greatest of dinosaurs, rivalled as it is only by Tyrannosaurus rex and Apatosaurus ajax as an icon of all things dinosaur. And before anyone (I'm looking at you, Mike) weighs in to complain about the title to this post, I know that dinosaurs aren't lizards, the title was chosen in a spirit of tongue-poking and ribbing. Ceratopsia is a very well-supported clade of dinosaurs. Not least of the characters uniting its members is the presence of the rostral bone - a small toothless bone at the tip of the upper jaw that is unknown from any other dinosaur and demonstrates the presence of a beak in the ceratopsians. 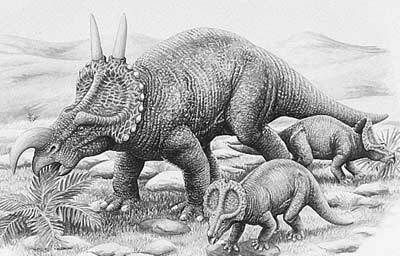 Some sources have pointed out that the name Ceratopsia is actually mis-derived and argued for the name Ceratopia instead, as well as Ceratopidae and Protoceratopidae instead of the more commonly used Ceratopsidae and Protoceratopsidae, but in this case a long history of usage has won out over strict linguistic accuracy*. Most authors accept that ceratopsians form a clade called Marginocephalia with the Pachycephalosauria, but it is worth pointing out that while it is the best-supported hypothesis to date, the support for Marginocephalia is not overwhelming and the question is worth former investigation. While Sereno (1986) placed the Marginocephalia outside the ornithopods, a recent analysis by Butler et al. (2008) produced a phylogeny that nested Marginocephalia within a number of taxa that had been regarded in the past as ornithopods, suggesting that marginocephalians are derived from within the "hypsilophodontid" grade of dinosaurs. Interestingly enough, this is actually more congruent with older pre-cladistic theories of dinosaur relationships that had implicitly derived both ceratopsians and pachycephalosaurs from ornithopod ancestors. It also reduces the significant ghost lineage that Sereno's topology suggested for marginocephalians. *Names ending in "-ops" have actually got a long history of being pains in the neck for zoological nomenclature. The ending "-ops" can be derived from the Greek word for "face", which is masculine, or for "appearance", which is feminine. Because many an author has ended a genus name in "-ops" without indicating which ending was intended, it is unclear for many such names whether they were meant to be masculine or feminine, a significant issue because it affects the form of any associated species names. It is because of this confusion that the ICZN has declared that all names ending in "-ops" are to be treated as masculine, regardless of derivation. Reconstruction of Psittacosaurus by Pavel Riha. The earliest known Ceratopsia date from the Late Jurassic. Ceratopsians can be divided into three distinct grades that have been classified as separate families in the past, but of which two are paraphyletic. These grades are the psittacosaurs, protoceratopoids and Ceratopsidae. The Ceratopsidae are the most familiar of the ceratopsians, and include the large horned quadrupedal forms. This group includes some of the first dinosaurs described from North America, albeit many from fragmentary remains which tragically means that such fantastic names as Agathaumus, Dysganus and (my personal favourite) Polyonax mortuarius, the "dead master of many", have been resigned to the oblivion of nomen dubium status. I'm going to leave the Ceratopsidae for some other time and introduce the more basal ceratopsians. Psittacosaurs are the basalmost group of ceratopsians - small and at least facultatively bipedal, they look not too different from a basal ornithopod and were classified as such when first described (Osborn, 1924), though a connection between psittacosaurs and ceratopsians was also recognised quite early on (though again, in those pre-Hennigian days the separation of psittacosaurs from ceratopsians as part of a paraphyletic Ornithopoda was not really seen as a problem). The majority of psittacosaurs have been included in the genus Psittacosaurus - in fact, with over ten described species (though not all of these may be valid), Psittacosaurus provides a welcome exception to the tendency of dinosaur systematists to keep their genera as small as possible (while sixteen species have been referred to Triceratops, almost all of these are invalid - Ostrom & Wellnhofer, 1990). In recent years, a few other "psittacosaur-grade" genera have been described, such as Chaoyangsaurus and Yinlong. The frill formed by the extension of the bones of the back of the skull that is so characteristic of other ceratopsians is absent from psittacosaurs, though a slight rearward curve of the squamosal (as well as the short snout) does help give the skull of Psittacosaurus a distinctly boxy appearance. 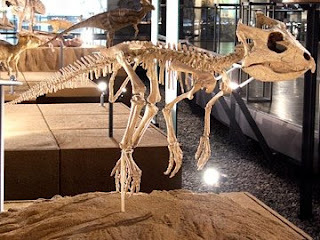 Psittacosaurus is actually one of the best-known of all dinosaurs, with literally hundreds of known specimens of all different ages. One specimen is known that preserves a row of long tubular bristles running down the tail of unknown function, probably display*. *With the admission that "display" is all too often something of a cop-out explanation for unusual structures. Mounted skeleton of Archaeoceratops oshimai, one of the basalmost protoceratopoids. Photo from here. I'm using the name "protoceratopoids" (a term plucked more or less out of thin air) to refer to the taxa previously included in the Protoceratopsidae, a taxon now well established to be paraphyletic with regards to the Ceratopsidae (the two groups together forming the Neoceratopsia). Taxonomic concepts in this grade are currently a little unstable - there may be a more restricted Protoceratopsidae formed from taxa forming a monophyletic group with Protoceratops, while other protoceratopoids are parcelled off into families such as Leptoceratopsidae. In protoceratopoids we see the development of the frill characteristic of Neoceratopsia, albeit still fairly small in many species. Most protoceratopoids lack the horns of ceratopsids, and were also much smaller than the ceratopsids. Some protoceratopoids such as Leptoceratops (which if the run of available reconstructions is to be believed existed for no other purpose than to provide food for larger, meaner-looking reptiles) probably remained bipedal, but other lines became larger, heavier and eventually quadrupedal. Analyses differ as to how many times quadrupedality evolved in ceratopsians (You & Dodson, 2004). One very basal protoceratopoid, Archaeoceratops oshimai, was a very gracile impish-looking little form that actually looks better adapted as a runner than does Psittacosaurus. Though often dismissed as basal forms, the bipedal ceratopsians were to survive for just as long as the quadrupedal forms, and Leptoceratops was actually a contemporary of Triceratops, one of the latest Ceratopsidae. Mention should also be made of the role of Protoceratops as an accessory to one of the biggest frame-jobs in the history of palaeontology. The first known specimen of the theropod Oviraptor was discovered overlying a nest of eggs that were identified as belonging to Protoceratops. It was this that gave Oviraptor its name ("egg thief"), and for many years Oviraptor was reconstructed mercilessly plundering protoceratopsid nests. 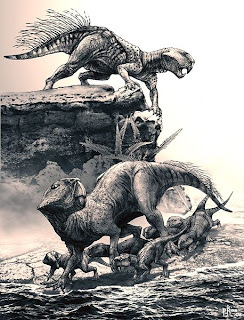 It wasn't until fairly recently that it was discovered that the "Protoceratops" eggs didn't belong to that taxon at all, but were in fact Oviraptor eggs, and far from stealing them, the much-maligned Oviraptor had probably been a diligent mother incubating them! I did attempt to speak to Protoceratops about its role in this shameful affair, but it refused to comment on grounds of being extinct. The majority of known basal ceratopsians - all psittacosaurs and most protoceratopoids - come from Asia, particularly northern Asia, and this is universally accepted to be the place of origin of this clade. The Ceratopsidae, in contrast, is only known from North America, as is the sister taxon to Ceratopsidae, Zuniceratops. It appears likely that their ancestors dispersed to North America from Asia before giving rise to the Ceratopsidae. Again, how many times this dispersal occurred is uncertain - members of the Leptoceratopsidae were also found in North America. The analysis of Xu et al. (2002) placed Leptoceratopsidae in a very basal position distant from Ceratopsidae, while that of You & Dodson (2004) found them as sister taxa (though I should point out that the latter analysis included significantly fewer taxa than the former). 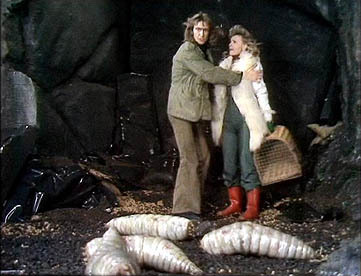 Two records of Ceratopsia from outside Laurasia are rather problematic. The South American Notoceratops, based on a single jawbone, was originally described as a ceratopsian but is suspected to have been a hadrosaur - unfortunately, this question will probably never be fully resolved because the type specimen has gone AWOL. The Australian Serendipaceratops is supposed to be very similar to Leptoceratops, but is known only from a single ulna. Butler, R. J., P. Upchurch & D. B. Norman. 2008. The phylogeny of the ornithischian dinosaurs. Journal of Systematic Palaeontology 6 (1): 1-40. Osborn, H. F. 1924. Psittacosaurus and Protiguanodon: two Lower Cretaceous iguanodonts from Mongolia. American Museum Novitates 127: 1-16. 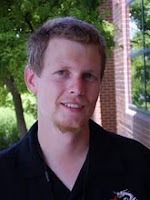 Ostrom, J. H., & P. Wellnhofer. 1990. Triceratops: an example of flawed systematics. In Dinosaur Systematics: Approaches and Perspectives (K. Carpenter & P. J. Currie, eds.) pp. 245-254. Cambridge University Press. Sereno, P. C. 1986. Phylogeny of the bird-hipped dinosaurs (Order Ornithischia). National Geographic Research 2: 234–256. Xu, X., P. J. Makovicky, X.-L. Wang, M. A. Norell & H.-L. You. 2002. A ceratopsian dinosaur from China and the early evolution of Ceratopsia. Nature 416: 314-317. You H. & P. Dodson. 2004. Basal Ceratopsia. In The Dinosauria, 2nd ed. (D. B. Weishampel, P. Dodson & H. Osmólska, eds.) pp. 478-493. University of California Press. And before anyone (I'm looking at you, Mike) weighs in to complain about the title to this post, I know that dinosaurs aren't lizards, the title was chosen in a spirit of tongue-poking and ribbing. Good to see some dinosaurs on CoO! Great post. I wish you'd gone into the Ceratopsidae a little more (fascinating group), but the protoceratopsids are underappreciated (even by me) so I'm glad the focus was on them. Now, the next post has to be about the big headed guys!